Handle tip bends to warn of hazardous overload. Handle tip replacement is easy and simple. Innovative design reduces the handle effort needed to release or lower a load. Double interlocking pawls assures positive load holding in all environments. Compact Aluminum Alloy FrameFeatures a double flanged strap drum and interrogated hook point for double line use. All stainless steel springs and shafts. All rotating shafts are mounted on bronze bushings. 360º swiveling hooks equipped with latches for positive load engagement. Minimum 4:1 design factor and all requirements of ASME/ANSI Standard B-30.21. Tested at 125% of rated load. Ratings shown on specification table, including lift and Working Load Limit (WLL), are for single line pull only. 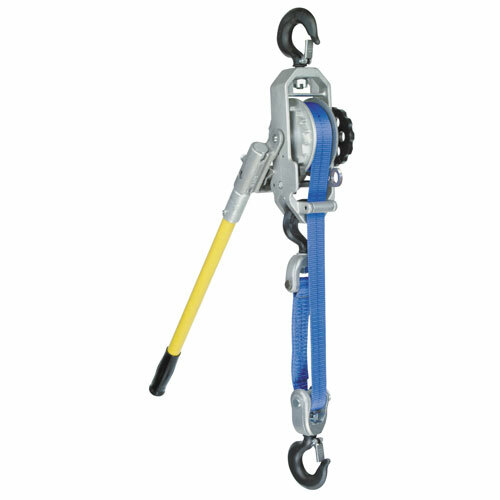 This hoist can be used in a "double line" configuration, with the following ratings. * Headroom numbers reflect the difference between single line and double line mode. Using the hoist in double line mode increases headroom.